In this episode of Flite Test, Josh Bixler shows us step by step, how to build the Fokker DR1 Triplane! 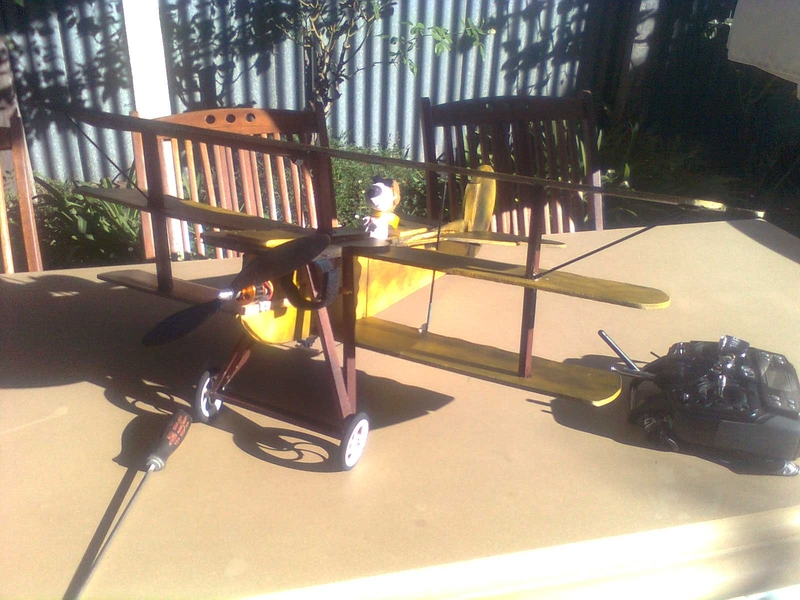 This plane goes together very quick, is cheap to build and also very efficient when in the air. Watch this episode to learn how to build your own. Goo dBuil, and Good video. Missed seeing Josh Scott, Doing color, his input was really missed. Keep up the good work. There are two folders inside of "Fokker DR1". One of them is "Fokker DR1 A4" and the other one is "Fokker DR1 Letter" Which one is it? I absolutely love the DR1. Built one from Scratch last year while i was in South Africa. Flew as scale as you could imagine from the first flight. I really want to build another now. Here is my build. Where did everyone go.. Been a Ghost town around here. It's probably the same thing, only depends on what size paper you are using. A4 or Letter. Can any tell me were to find the SE5a used in the combat video? I have only found a full fuse version but would like to find somthing more like this one. 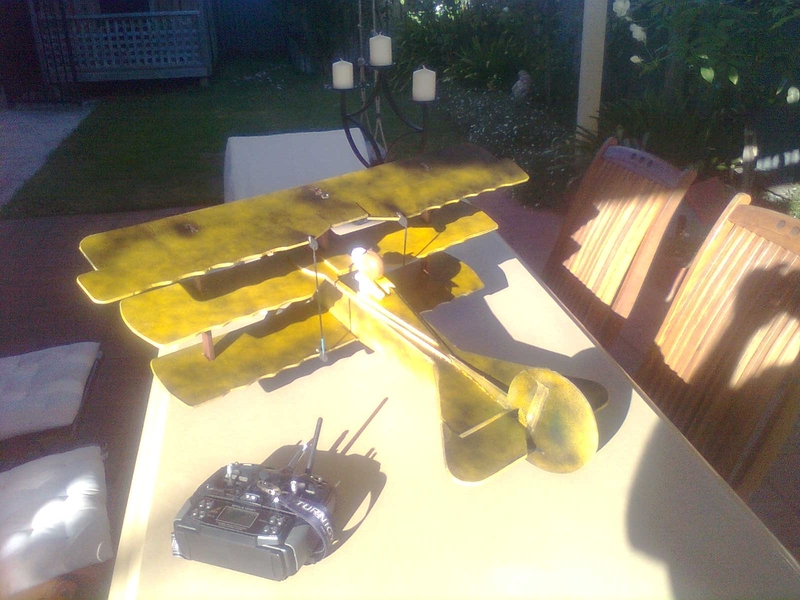 I just finished my Fokker DR1! Just waiting for the motor and props from HobbyKing. What do y'all think? WOW! Looks great in red as well! This looks great. Did you remove the paper from the foam board? I am not sure whether it matters or not, but there is no mention about that in the video. Here in Australia I can only get foam board covered in paper. Thanks guys! The motor came in today so I hope to have it in the air soon. I left the paper on and I believe he did in the video as well. it seems to add some rigidity to the model. I have used the Dollar Tree foam on a flat foamie P-51 before and it works great as long as the paper doesn't get wet. Mine got damp from belly landings on morning flights. I just tape it back after it dries and its fine. Hopefully this one wont be getting wet since it has landing gear! Thanks guys! The motor came in today so I hope to have it in the air soon. Hey Chops! Looks awesome!! What paint did you use?? I haven't made the cut-out in the fuselage for my DT750 motor, and my order from HK is held-up right now due to a couple of backordered items. Is the cut-out on the plans gonna be about right for the DT750 fit?? Looking forward to your flight update!! I used satin red Vlaspar spray paint from Lowe's. I did about 3 coats in all by the time I got all the white covered. The black is craft paint from Wal-Mart. As for the motor, I ended up using the Turnigy Park480 890kv since they were out of stock on the DT750. It fit in the cut out pretty well. I did fill in the long piece that was cut out (i dont know what it was for). I built up a mount using two pieces of foam sandwiched between two pieces of styrene. I hope to try it out soon! How did you fasten the motor to the mount? I used M3 bolts and lock nuts. I hot glued the mount the the fuse. Hotglued? Well, I hope that holds up for you... If that motor comes loose it will do a nice ninja job on the foam! 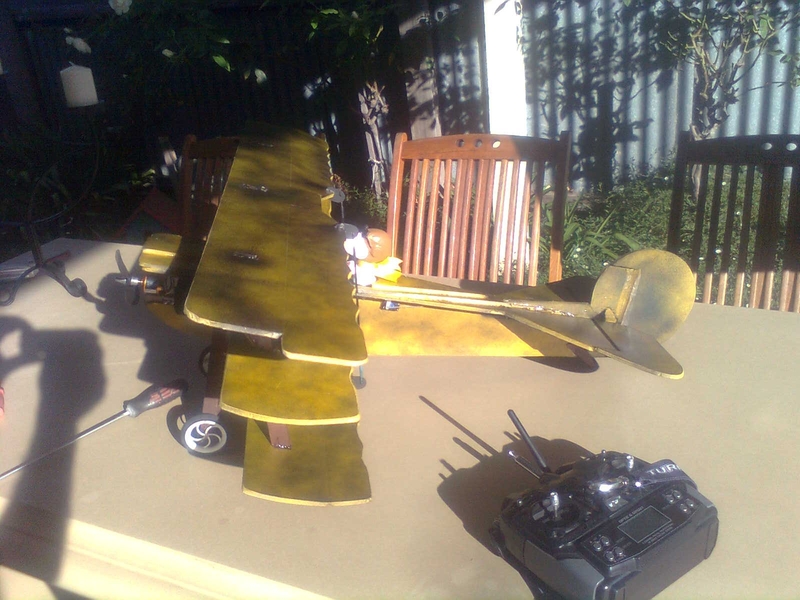 This plane is definitely lighter and more unstable than the Mikeys V3 plane I built. I'm still waiting for a calm day to see what this plane can do. I flew it in ~10mph wind three times and ended up repairing it three times. I'm concerned it might be underpowered, I'm using an exceed optima 450 1050kv and a 10x4.7 prop. I made a Se5a to go along with the Fokker! It is a good bit smaller than the DR1 but I think it will fly well (hopefully lol!). Well I've finished my first scratchbuild using foam board. I had some problems with warping of the wings which I think I've sorted out using extra wing struts from the outer wing supports to the top wings. It all looks straight at the moment. I even had a little time to make a pilot for this plane. Hope he's not the nervous kind. I have learnt a lot building this model and while it's not as pretty as some of the others I've seen in this thread I think it should fly ok. Just need to find some time to maiden it.